cue case, you receive a 100% one year warranty against defects in material and workmanship. players with playing skills ranging from Intermediate all the way through Touring Pro. Of the hundreds of custom cue cases that I have created and that are in play around the world today...I have no dissatisfied customers. Please visit my testimonial page where you can read a sampling of the many customer comments that I have received after delivery of their new OnQcase. 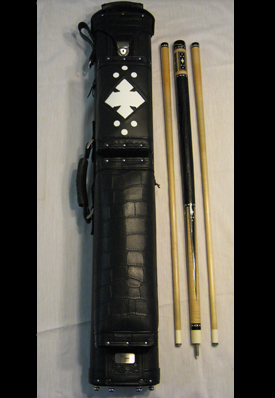 might give you ideas as to the type of custom cue case you would like to order. Copyright 2006. OnQcases. All Rights Reserved.